Advocates working to prevent bear-human conflicts want a bin that's easy to use while resistant to bears. 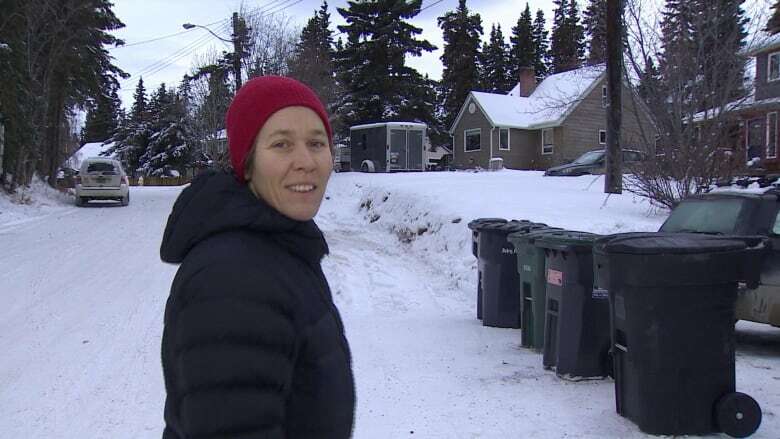 The citizens group WildWise Yukon is continuing its search for an easy to use and effective bear-proof garbage bin in Whitehorse. Its goal is to reduce human-wildlife conflicts. In 2018, there were 267 human-bear conflicts in Yukon — an all-time record. Conservation officers euthanized 33 bears in 2018 while an additional 21 were killed "in defence of life or property." Heather Ashthorn is the executive director of WildWise Yukon. For the past year, she's been testing bear-proof garbage bins as part of a joint project with city and territorial officials. "It's a bit of detective work. We've tried some latches. We've tried some complete units. We're working our way towards a product," she said. 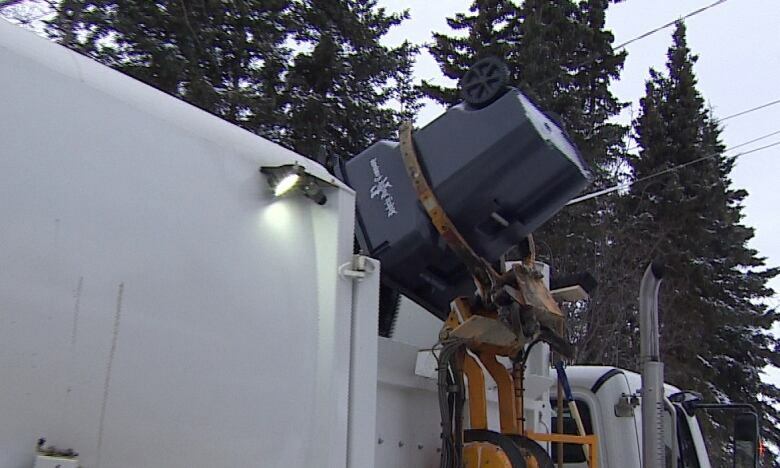 Ideally, she said, the city's existing 6,500 residential bins could be outfitted with easy-to-use latches and made tougher for bears to break open. 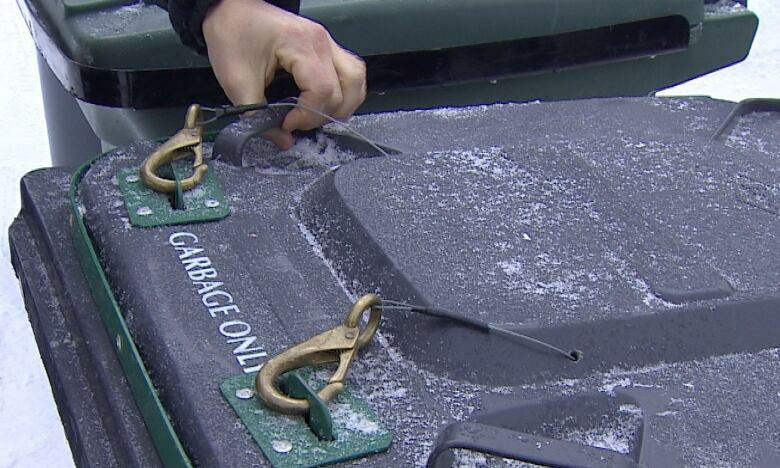 WildWise launched a pilot project in 2013 with a bin that worked. But it required frequent latching and unlatching of cables and didn't catch on with many people. Ashthorn said there have been similar issues in other communities using that system. A new bin, manufactured by the Rehrig Pacific Company, arrived this week for the group to try out. A crucial test was on Tuesday when the city garbage truck pulled up. The truck hoisted the new bin with no difficulty and with the lid falling open at the proper time. Ashthorn said one of the bins she's tested hardly ever opens while another has a hard to get at latch that would make it difficult to use in the winter. "This is a long game," she said. "We're not going to be able to roll something out next month and it might not even happen this year. We don't know, the city's timelines will definitely dictate what happens over the next while." The city could start by outfitting new homes in the Whistle Bend neighbourhood with bear resistant carts, Ashthorn said, and even go a step further by requiring all new homes to have a bear-proof shelter to put the bins in.